I’ll be the first to admit that, as a family, we don’t eat as many vegetables as I would like. They are usually an afterthought in my meal planning. So I’m always happy when I discover a new way to make vegetables the focus of a meal that is more than just a salad. If my kids eat it without complaint then it’s pure gold. That’s why I’m loving these winter vegetable grain bowls. 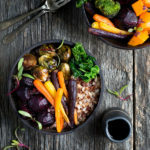 The base of farro and red quinoa is nutrition and protein packed but it’s all the roasted vegetables on top that makes these bowls worth their weight. You can customize the vegetables to what your family loves or whatever you have on hand. It’s completely flexible. Our favorites include beets, broccoli, carrots, and brussels sprouts. Roasting is one of the easiest ways to cook a lot of different vegetables at once and the char you get from roasting adds amazing depth of flavor. If you’ve got some extra time, you can also sauté some kale to really up the veggie game but that’s totally optional. Rather than making a dressing to go on top, I like to top my grain bowls with some ponzu sauce. It adds a little brightness and ties the flavors together nicely. Now you could totally stop there and have one heck of an awesome vegetable grain bowl. However, I’m a big believer of the “everything is better with an egg on top” philosophy. So, of course, I have to add a soft-boiled egg with that perfect slightly runny yolk. Making a soft-boiled egg to your liking is all about the timing. I like slightly runny yolks for these bowls which means simmering the eggs for 6.5 minutes. At 6 minutes, the yolks are very runny. At 7 minutes, the yolks just start to set. The eggs get added when the water comes to a boil so I find it helpful to have a deep slotted spoon to gently lower the eggs into the water. I also let the eggs sit at room temperature while heating the water to reduce the chances of the eggs cracking when they hit the hot water. Finally, I don’t try to do more than 4 eggs at a time since the timing is so precise. Use the recipe below as more of a guideline. Everything (except for the timing of the eggs) is really flexible. If you want something gluten-free, skip the farro and use all quinoa. If you’re looking for something vegan, skip the eggs. Cooked farro and quinoa freeze really well. Let them cool completely on rimmmed baking sheets and then transfer them into freezer-safe containers. I like to make big batches of each and then portion them into 2 cup containers to store in the freezer. It reduces prep time when I need to pull dinner together without a lot of effort (i.e. every night). Fill 2 medium saucepans with 5-6 cups of water. Bring to a boil. Add a generous pinch of kosher salt to each pan. Drain the quinoa in a fine mesh strainer and then add the quinoa to the one of the pans. Repeat with the farro. Reduce heat to a medium simmer and cook the quinoa and farro until they are al dente, stirring occasionally, 15-20 minutes. Drain the quinoa in a fine mesh strainer and then spread the quinoa on a rimmed baking sheet to cool (see Notes). Repeat with the farro. While the farro and quinoa are cooking, roast the vegetables. Heat oven to 450 degrees. Place the broccoli, carrots, beets, and brussels sprouts in a single layer on 2 rimmed baking sheets. Drizzle generously with olive and sprinkle with salt and pepper. Toss the vegetables with the olive oil until vegetables are evenly coated. Roast the vegetables in the oven until they are tender and nicely charred, 20-25 minutes. If using kale, heat a small skillet over medium heat. Drizzle in some olive oil and then add the kale leaves. Sauté the kale until tender-crisp. Season with salt and pepper. Remove eggs from the refrigerator and let sit at room temperature. Bring a medium saucepan of water to boil (you can use one of the pans from cooking the grains). When water is boiling, reduce heat to a low simmer. Using a slotted spoon, gently drop in the eggs. Set timer for 6 minutes and 30 seconds. Increase heat so that water is at a high simmer. When the timer goes off, transfer the eggs to a bowl of ice water. Chill until eggs are warm but cool enough to handle. Peel eggs and set aside. Put desired amounts of farro and quinoa into serving bowls. Top with desired vegetables. Drizzle with ponzu sauce. Carefully cut eggs in half and place on top of each bowl. Serve. Soaking the farro and quinoa will allow them to cook much faster. If you haven’t soaked the grains, you will need to increase the cooking time. Spreading out the cooked farro and quinoa on the baking sheets, let’s them dry out a little bit so they have better texture and don’t get mushy.